The Academic Film Archive of North America, a 501(c)(3) non-profit organization, was incorporated in February 2001. Our programs have been in operation since October, 1996 at which time we operating under the name "ciné16". To acquire, preserve, document, and promote academic film by providing an archive, resource, and forum for continuing scholarly advancement and public exhibition. Of the more than 100,000 educational films made in North America between the early 1900s and approximately 1985, many of the most compelling were made on in the fields of art, history, social science, literature, and science. These we refer to as academic film, as opposed to guidance films, made in health, safety, civics, and other non-academic educational subject areas. Academic films are rapidly being discarded by film libraries and destroyed or dispersed into private ownership, jeopardizing their accessibility to film historians and scholars, and the public at large. The Archive’s mission includes public advocacy of preserving films within libraries when possible, and accepting donations, space permitting, when not. In addition to the preservation of such films, the Archive actively engages in programs to gain belated recognition for the largely unrecognized men and women who made these films. Many of the films from our collection are available to view at our collection site at the Internet Archive. The AFA Manifesto explains our advocacy position. The Academic Film Archive of North America is the only entity specializing in the research and documentation of the classroom academic film, a genre encompassing more than 100,000 titles. The archive’s focus is on films made between 1960, in which increased federal government funding contributed millions of dollars to academic film companies, and 1985, when decreased funding and the advent of videotape brought an effective end to the 16 millimeter classroom film. Areas of research include individual films and series, biographical and philosophical information on filmmakers, and histories of companies specializing in making and distributing academic film. Our review team continually views elements in our collection and enters the information into our database. AFA director Geoff Alexander has written two books on the subject of academic film. 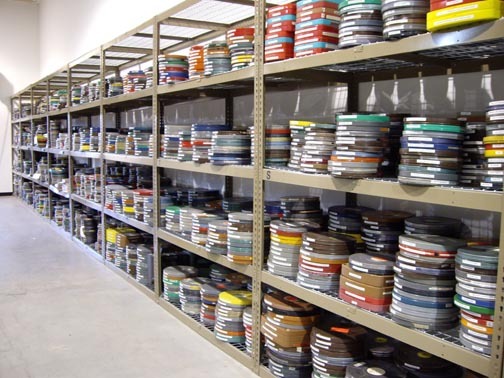 The Archive’s collection consists of approximately 10,000 films, including hose on extended loan. The majority of them are housed at History San Jose's Collection Center. Several hundred letters and production and publicity photographs are on extended loan. Our mandate is to make as many of these films available to the public as possible on the internet, at our collection site at the Internet Archive. We sponsored 412 weekly film programs, consisting over 1,502 films, in San Jose, California, from October 1996 through October, 2004. In addition, Monthly film programs were staged in St. Louis, Missouri, from October, 2002, through 2008. Historical data on the films are encapsulated in film notes, available through a free email subscription list, and archived permanently on the Archive’s chronological filmnotes pages for scholars and historians. The Archive has hosted special events consisting of retrospectives of the work of academic filmmakers, with the filmmaker in attendance. There have been eleven of these events to date, and filmmakers have included documentarian Richard Leacock, filmmaker and Caldecott-award winning children’s author Gerald McDermott, and Academy Award winner Bert Salzman. In most cases, this has been the sole retrospective of the work of a given filmmaker. We hosted a Partner Cities program, populating AFA affiliate archives in other cities with duplicate titles from AFA's master archive. St. Louis, Missouri was our first Partner City, and hosted its first program in October, 2002. San Jose Film Festival, 2000. The Academic Film Archive of North America coordinated the appearance of documentarian Richard Leacock, and director Geoff Alexander moderated the filmmaker’s public discussions. Künstlerhaus, Stuttgart, Germany, 1998. Archive director Geoff Alexander hosted a series of four lectures illustrating, with film examples, important milestones in the history of Academic film. The Archive’s extensive website is accessed by thousands of users around the world seeking information on films and filmmakers in the academic film genre. The archive answers all questions through email, most of them within 24 hours, on a no-fee basis. Archival researchers are available to assist individual academic filmmakers, many of whom are elderly, to document their own collections, and provide guidance to best preservation practices in situ. For a case study, please see the Clifford West Archival and Preservation Project. The Archive assists individuals and institutions wishing to start their own academic film libraries and non-traditional performance spaces by providing advice on initiating public programs and preserving films. Such information is available through a page on the AFA website, and through email inquiries, on a no-fee basis. The Archive's collection is situated at History San Jose. The Archive’s all-volunteer staff comprises individuals who are active contributors to the Archive’s mission. Contact us if you'd be interested in being a volunteer. Future directions include the ongoing and increasing expansion of our free, publicly accessible film website on the Internet Archive. We are in the process of documenting and archiving thousands of paper study guides that were used to provide guidance to teachers using these films. We have also collected taped interviews with many academic filmmakers, which we eventually hope to digitize, transcribe, and upload to the Internet Archive.